Hi Guys! So I think I've mentioned before that we have been trying to use our grill as much as possible now that Summer is in full swing! There is nothing like being outside in the backyard, enjoying the evening shade and the aroma of bbque coming off the grill! Which leads me to this easy recipe! Enjoy! 1 cup dry Jasmine rice, prepare according to package directions. First, trim and cut into cubes your meat of choice. Put the cubed meat into a ziploc bag and add a little of your favorite teriyaki sauce. Shake the bag well so the meat gets evenly coated. Put it in the fridge and allow it to marinate for at least 30 minutes! Then, prepare your vegetables for the grill! Cut your cabbage into quarters. The other vegetables are already good to go! Prepare the jasmine rice. 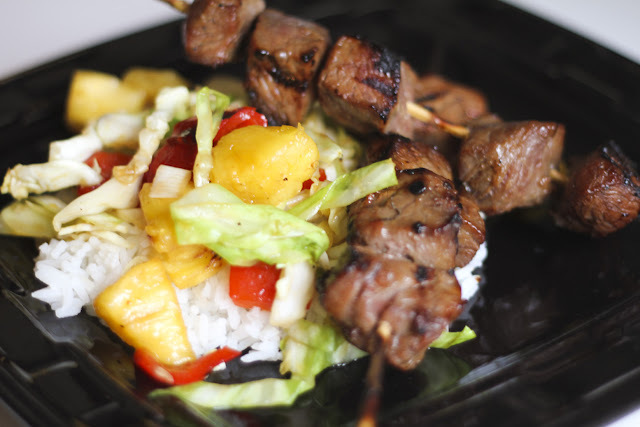 While the rice is cooking, take your meat out of the fridge and put the cubes of meat on skewers, 5 to a single skewer! 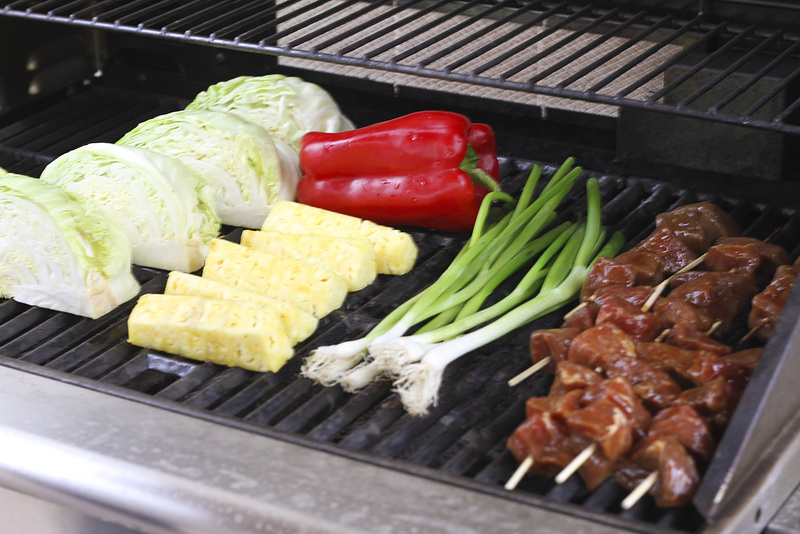 Brush your grill with vegetable or canola oil (helps the meat not stick) and turn it on to medium high! Once you've put your meat and vegetables on the grill, turn the meat every 3 minutes for even grilling and caramelizing. Turn your vegetables once they have slight grill marks. You still want the vegetables to have a crispness, not cooked all the way through! Once everything is grilled to perfection, prepare your vegetable slaw by cutting the tough ends off of the cabbage and thinly slice it. Peel the charred skin off of the red pepper and slice into thin spears. Chop up the green onions and pineapple. Throw all the sliced and chopped vegetables together in a large bowl. Add a little canola oil and your favorite teriyaki sauce and mix to coat the veggies! Now you are ready to serve! Plate it up like we did in the picture or however you would like! This is an amazing meal that will leave you feeling good and satisfied but not weighed down! Oh man, anything on a skewer is all right in my book. Yum!